Interim President of Michigan State University and former Michigan Gov. John Engler testifies during a hearing before the Consumer Protection, Product Safety, Insurance, and Data Security Subcommittee of Senate Commerce, Science, and Transportation Committee July 24, 2018, on Capitol Hill in Washington, DC. Michigan State University is poised to name a new interim president Thursday after the former governor who was brought in to help it recover from the Larry Nassar sexual abuse scandal resigned under pressure, amid backlash over his comments about some of the ex-sports doctor's victims. 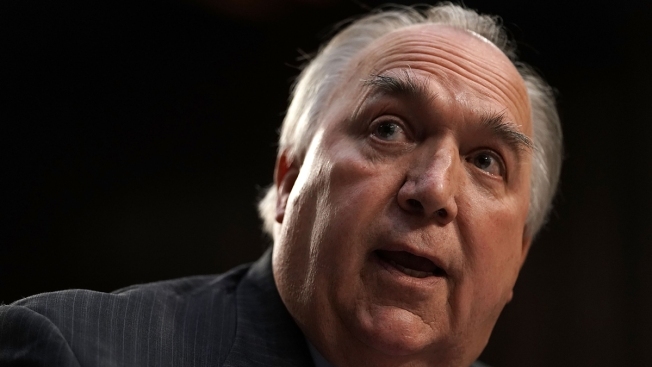 John Engler — who had resisted calls to step down in the past — quit in an 11-page letter to Dianne Byrum, chairwoman of Michigan State's Board of Trustees, effective Jan. 23. It makes no mention of recent criticism of his recent remarks and instead lists what he considers to be his accomplishments in nearly one year of service, saying the university is a "dramatically better, stronger institution." "It has been an honor to serve my beloved university," wrote Engler, who is in Texas attending a burial service for his late father-in-law. With his sudden reversal, Engler joins a long list of people — including his predecessor as president — who have been fired, forced out of their jobs or charged with crimes amid fallout from the school's handling of the once-renowned sports physician stretching back decades. The final straw for the university's governing board came last week when Engler told The Detroit News that Nassar's victims had been in the "spotlight" and are "still enjoying that moment at times, you know, the awards and recognition." Brian Mosallam told the AP that the board had enough votes to force Engler out at the special meeting scheduled Thursday at the school in East Lansing. Byrum, who became chair last week, stopped short of confirming that she asked Engler to resign but told the AP he had "a decision to make" because the board is poised to name a new interim leader at the meeting. Both Byrum and Mosallam are Democrats, and Engler is a Republican. Engler's comments, Byrum said, make "it very difficult for the MSU community to make the changes necessary and rebuild both trust and credibility, and frankly for the survivors to heal." Mosallam, a long-time Engler critic, said on Twitter that "JOHN ENGLER'S REIGN OF TERROR IS OVER." Denhollander told the AP on Wednesday that her hope is that the board "is signaling at least the beginning of a true change in direction and tone. And in order to do that, they have to deal with the person they put in place."